(Bridgewater, N.J., June 19, 2016) - The Somerset Patriots weekend attendance of 22,907 fans from Friday, June 17th through Sunday, June 19th has set a new Atlantic League weekend attendance record. The three game attendance total tops the previous mark of 22,886 set by the Sugar Land Skeeters from September 7th through September 9th of 2012. Somerset’s weekend games included 8,071 on Friday, 7,917 on Saturday and 6,919 on Sunday. The weekend featured two fireworks shows and a special Father’s Day celebration. The Somerset Patriots have held this record several times, most recently with 22,175 during the 2005 season. That number remained as the franchise record until this weekend. “These are the weekends you dream of when you see the schedule for the season. You couldn’t ask for more beautiful days at the ballpark. 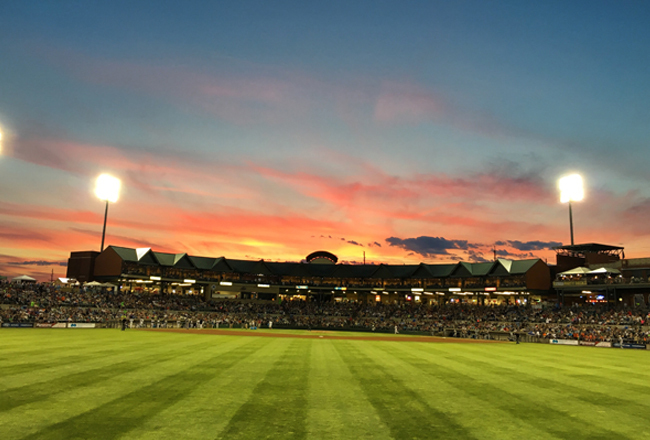 Our fans came out in force to spend time with their families and friends and got to see some great baseball, fireworks and create memories here that will last for a very long time,” said Somerset Patriots President/General Manager Patrick McVerry.